The flute is one of the most popular instruments in the band or orchestra. As a member of the woodwind group, it is an aerophone, or reedless wind instrument. It has a beautiful mellow tone and is a lead instrument, often carrying the melody. Producing a tone on the flute is similar to blowing across the top of a bottle. Once you can make that sound, simply use the keys to change the notes. Flute isn't hard to learn. Like all instruments, it just takes some practice. 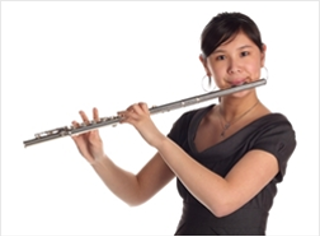 If properly cared for, your flute should remain in pristine condition for years to come. The most important thing is proper cleaning after you finish playing it. After disassembling your flute, use your swab to remove all moisture from the inside of the body. If there is moisture in the pads, remove it by inserting clean paper between the pads and tone holes and pressing the key several times. After cleaning the interior section, move to the surface of the instrument. With a polishing cloth, gently wipe down the flute, cleaning it of smudges and fingerprints. Make sure to be gentle around the keys. Every once in a while, polish your flute with a small amount of flute polish and clean between the keys with a small key brush. You will periodically need to oil your keys as well. Here are some of our favorite flute performances and a few flute tips and tricks. There are lots of great reasons to play flute. Flute is fun to play in duets and ensembles, and it sounds good with almost all other instruments. Flute is not difficult to learn. With practice you can be as good as you want to be. Once you can play flute, you can also play piccolo. 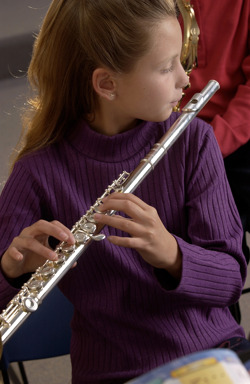 Other woodwind instruments (clarinets and saxophones) play similarly and are easy for flutists to learn. Amro Music offers high quality flutes for sale, as well as rentals. We service the Memphis and Nashville areas. Browse our wide selection of flutes, and contact us with any questions. Our professionals are ready and willing to help!